Today’s tip goes well with yesterday’s tip, which explained how to open any Finder item’s folder in Terminal via Keyboard Maestro. Once in Terminal (and sometimes even when not in Terminal), I’ll often want to check out the man page (help) for a given command. You can do this directly in Terminal with man [name of command], of course, but then it opens on top of whatever you were working on, and you have to read it in Terminal. You could use another tab or window, but you’d still be reading in Terminal. There are times, too, when I’m writing about the Unix side of macOS, so I’m not even in Terminal, but still want to view a man page. 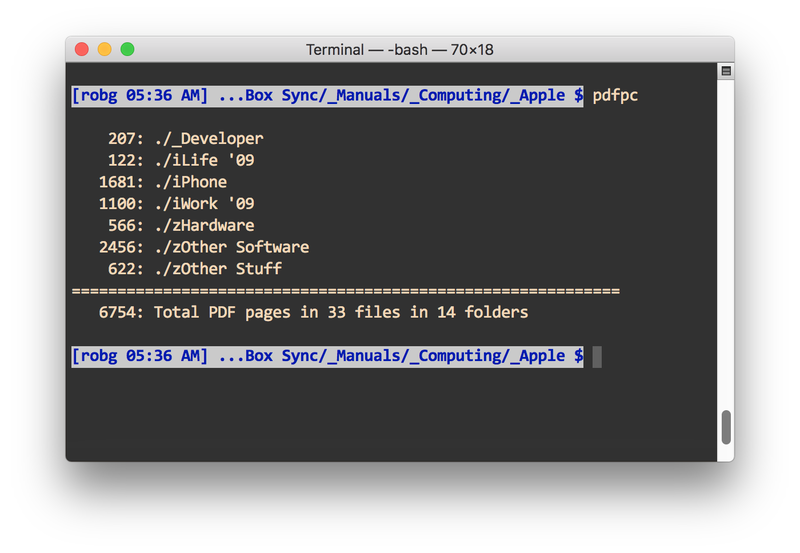 My solution to this problem is two different ways of doing the same thing: I open man pages as nicely-formatted PDFs in Preview. The method I use to get to that point depends on if I’m working in Terminal or not. Update: I’ve modified the script and macro so that they properly handles two-argument man commands, such as man 3 printf. #!/bin/sh cmd=$@ man -t $cmd > "/tmp/$1.ps" open "/tmp/$1.ps"
man -t $cmd > "/tmp/$1.ps"
In other words, the -t converts the help page into a PostScript file, which is something that Preview can easily open (which is just what the last line of the script does). I named this script preman, because it uses Preview to open man pages. Once saved, I made it executable (chmod 755 preman), and I can then open any man page in Preview by typing, for instance, preman bash. The output is nicely formatted, and by opening the man page in Preview, my Terminal session is uninterrupted. A quick adjustment with Moom, where I have a saved layout to position Preview and Terminal, and I can scan the man page while working in Terminal. But what about when I’m not in Terminal? For that, I basically implement the same shell script, but with it set up to run within a Keyboard Maestro macro. Note: This article has been heavily modified, as I was a total knucklehead and completely forgot about GPL v3—thanks to Geordie Korper for pointing it out in the comments. Basically, the cause of the aging Unix tools in OS X is GPL v3. I’ve updated the following table to include the license information. In every case but one (nano), GPL v3 is the license on the non-updated apps. So that’s that…I’ll leave this up, though, in case anyone’s curious about this stuff. As I covered recently, the version of bash that ships with OS X is quite old, and as such, is vulnerable to the recently-revealed bash security hole. In case you missed the news, there’s a big security hole in the bash shell. If you’re using an OS X machine and it’s not exposed to the internet (and even then, not running a publicly-facing service that communicates with bash), you shouldn’t have much of anything to worry about. In theory, anyway. In practice, because I like to live dangerously, I decided I wanted to make my machine safe. Or at least try. What follows is the how-to for how I did it. Note: Please exercise extreme caution if you’re going to follow my how-to! I am replacing a couple of key system-level files with a new, untested-by-Apple version. It’s quite possible this may break my system in ways I haven’t yet discovered. Also, given that there’s probably not any exposure for a typical user not running web-facing apps that interface with bash, this really isn’t worth doing for most users.